The branch at the point of the heading cut produces a flush of new growth, usually numerous, vigorous and disorganized sprouts. This “witch’s broom” of new growth destroys the tree’s natural growth habit and beauty. Sprouts are often long and upright with little variation in shape and structure. In producing such profuse growth to replace the lost foliage, the plant is soon as tall as it was before topping. But now the crown is denser, requiring extra time and effort to prune. The sprouts also create a foliage shell, shading the plant’s interior, often causing inside branches to die back. Finally, the new sprouts are inadequately attached, crowded and prone to breakage. Although topping is sometimes done to make trees safer, they can become more hazardous after topping. 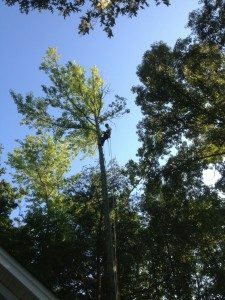 Crown Reduction is the selective removal of live branches to decrease the height or spread of a tree’s crown, in this situation the use of what is known as “drop-crotch” pruning cuts is required. A drop-crotch pruning cut removes the end of a branch by cutting back to a crotch created by a lateral branch. This side branch needs to be at least 1/3 the diameter of the branch being cut. If the branch is 1/3 the diameter of the parent branch or larger, water and nutrients will be redirected into the lateral branch and it will assume the terminal growth responsibility of the removed branch. The tree will produce less sprouts at the point of the pruning cut and the tree’s natural growth habit will be preserved. 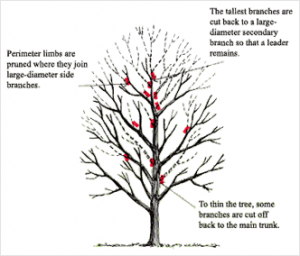 Crown reduction pruning is most often used when a tree has grown too large for its permitted space. This method is preferred to topping because it results in a more natural appearance, increases the time between pruning and minimizes stress. At Tree Tech we are committed to implementing the correct strategy, ensuring, you are left with happy, healthy trees.